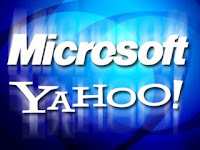 Ever since Microsoft (MSFT) made its $45 billion bid for Yahoo (YHOO) in early 2008, it was clear the software giant was serious about taking on arch-rival Google (GOOG) in the lucrative Internet search business. And now, after more than a year of more limited talks after Yahoo denied that bid, it seems Microsoft has achieved its goal. If reports of an impending deal between the companies prove true, Microsoft will emerge as the clear No. 2 player in search. In a deal that presages its departure from a market it once dominated, Yahoo will essentially scrap its own efforts to best Google in search and instead rely on Microsoft's recently debuted Bing search engine, according to reports in The Wall Street Journal and the BoomTown blog. Ads placed next to those search results would be served up not by Yahoo's ad platform, dubbed Panama, but by a Microsoft technology called AdCenter, says another report from Advertising Age. Yahoo CEO Carol Bartz "is essentially giving up on search," says Danny Sullivan, editor of Search Engine Land. Yahoo salespeople likely will continue to sell the search ads that appear both on Yahoo sites and on Bing. And the company that sells an ad—in this case, Yahoo—may get as much as 80% of the resulting revenue. But Microsoft would nevertheless reap a reward that's more valuable in the long run. The data on computer users' online search and buying habits would ultimately reside on Microsoft's computers, thereby improving its ability to automatically serve up the most relevant ads. "If Microsoft is running the underlying ad technology, it doesn't matter who is selling the ads," Sullivan says. "In the end, Microsoft will hold all the cards." He adds that most advertisers place ads by filling out online forms, with no involvement from salespeople. Maintaining control of sales makes the deal "sound rosier for Yahoo than it really is, because in the end Yahoo won't have the technology needed to compete." Microsoft wins in other ways. The deal gives a big boost to Bing. The combined search market share of Yahoo and Microsoft would approach 30%. That's still far below Google's 65%, but analysts say it may provide enough of a critical mass at least to stave off further Google advances and help the enlarged search engine gain some ground. At a minimum, the deal doubles as a kind of insurance policy for Microsoft, in case all of the positive buzz about the Bing search engine doesn't translate into actual market share. By adding Yahoo's 20% market share, Bing assures its place as the only search engine provider other than Google with size that really matters. So what's in it for Bartz? For starters, Yahoo can slice millions of dollars in technology development costs, while continuing to bring in or even grow its search ad revenue. That's because its salespeople will sell not only ads running on Yahoo sites, but also on Bing. The recently appointed CEO also buys time to hone Yahoo's strategy and improve other moneymakers, such as placing banner-style display ads that appear on Yahoo's highly trafficked portal and e-mail pages. And by continuing to sell search ads, she maintains relationships with key advertisers rather than let Microsoft walk away with them. "Yahoo doesn't want to look like they've sold off their crown jewel for short-term gain," Sullivan says. "This creates the illusion that they have more control of the situation than they probably do." It's an illusion that will likely work with Yahoo's long-suffering shareholders. Indeed, the deal will probably be welcomed by investors in both companies, since it lets each play to its respective strengths. Yahoo is most successful as a media company—and that includes selling advertising. Microsoft, on the other hand, is a technology powerhouse, with vast software development capabilities and the cash to build the billion-dollar data centers needed to run search engines and ad platforms. The roles represent a stark reversal from half a decade ago, when Microsoft used both Yahoo's search technology and its search-ad system. "It's good for both of the companies," says Sandeep Aggarwal, an analyst with Collins Stewart (CLST.L). It's not yet clear whether the final terms have won approval by both companies, and it could be delayed beyond the expected July 29 announcement date. But the reports indicate that negotiations, which recently heated up after more than a year of on-again, off-again talks, are essentially complete. Yahoo and Microsoft declined to comment. The arrangement will also have to get a nod from antitrust officials. It probably will, given both companies' relatively small market share next to Google's, and advertisers generally are likely to be in favor of the deal since it bolsters a competitor to the market leader. But Google no doubt will raise objections, which could at least slow down the approval of the deal. Moreover, the complexity of the deal means it will take the two companies longer to integrate operations than if Yahoo simply outsourced search and search ads to Microsoft, as Microsoft originally proposed. "It's certainly a deal with a bunch of moving pieces," says Tim Cadogan, CEO of the online ad technology and services firm OpenX and a former Yahoo ad sales and search executive. But if and when those pieces fall into place, it will become abundantly clear which party gained the upper hand in the arrangement, and which one has a fighting chance against Google.